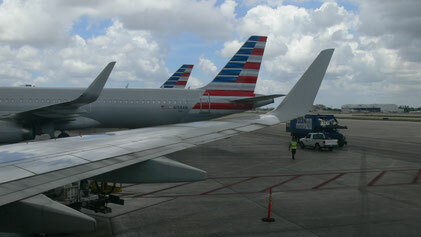 My return trip to Germany started with a crowded Terminal D at Miami Airport. Our group was leaded to a Check-In machine where we should print our tickets. Due to an error by the machine the passport of one of my fellow travelers was not identified and we could not get our tickets. After a few tense minutes a older man from American Airlines helped us out and he printed the ticket manually. He explained that those ticket machines had some problems with foreign letters like the german: Ä, Ö and Ü. Then he wished us a nice flight and he apologized for the inconvenience caused. Although the airport was so crowded on this day, I have never passed the security check that fast and I never had security officers that were that friendy to the passengers. With a golf cart, our group was driven to Gate D2. We were so early on this day, that we had enough time to walk through the Duty-Free stores. Miami's Duty-Free variety offers a wide range of souveniers, large alcohol bottles, sweets, jerseys. Also there was a sports bar where we watched a bit of the trial game between Borussia Dortmund and Rot-Weiß Erfurt live. Back at the gate I saw our aircraft which arrived earlier. The first pieces of luggage have already been loaded. 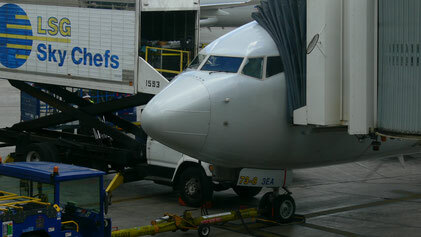 Flight 2619 was operated with a Boeing 737-800 aircraft. The registration of this in February 2001 to American Airlines delivered aircraft was N955AN. Later in 2007, the 737 got some new wing tips in the hangar. Boarding began and a few minutes later I took my seat onboard. The first thought I had was: "This airplane is not older than one year." Only when I saw the dirt on the wings I knew that the plane did not arrive directly from the Boeing factory. American had built in state-of-the-art technology. There were new slim-line seats built in. Also they built in over-head displays to show the latest information and the safety video. We were welcomed by a young purser. Meanwhile the 737 was pushed back and the engines were started. After the pilots completed the "before taxi checks" like lowering the flaps and checking the flight controls, we began our journey to the runway. Therefore we had to taxi across nearly the entire length of the airport. After a short waiting time we lined up runway 8R and took off from Miami heading North-Carolina. Instead of turning to the north, the pilot flew the plane in about 3000 feet over Miami Downtown and Miami Beach before he than finally turned to the north over the atlantic ocean. On this very short flight we received some pretzels and beverages. Also the cabin crew served something like a milk roll. Over Georgia I saw a Scandinavian Airlines Airbus A330 from Oslo heading Miami. Besides a Safety card, an airsickness bag and the American Way Magazine, there was also a nondescript card in the seat pocket, with which the passenger was informed that he could use his smartphone, tablet or laptop to get free wifi and watch some movies during the flight. You could choose between eight different movies. Unfortunately I had no smartphone that worked properly at this time, so I could not try this feature. Over South Carolina we began our descent after an unspectacularly flight. Like the entire flight, the approach was also calm. The landing in Charlotte was the hardest of all four landings at this trip. In my opinion the machine came down to fast so the pilot could not break the sinkrate with his flaremaneuver. After exiting the runway the purser welcomed the passengers: "Ladies and gentlemen, welcome to Raleigh-Durham!" With this sentence said, their was a mumble going through the aircraft and all passengers looked confused to the person next to them. A flight attendent must have said something to the young purser because after a short pause he said: "I'm so sorry, we just landed in Charlotte, yes Charlotte. Welcome to Charlotte ladies and gentlemen!" There was applause and many relieved faces. Meanwhile we taxied to Gate B13, the taxi time was very short. While leaving the aircraft, the purser apologized for his fauxpas and wished me a pleasant connecting flight.